Affordable huntington harbour life style, this skyline mfg. Home is situated on a corner lot with over 2,200 sq/ft. Of living space in the highly desirable community of rancho del rey, this home really delivers with interior amenities that include beautiful laminate wood flooring, solar powered air conditioning, dual pane windows, vaulted ceilings, recessed lighting, high ceilings throughout, open floor plan. Kitchen features walk in pantry, corian countertops, island with built in storage cabinets, inside laundry room with built in storage cabinets and additional space for freezer. The master bedroom offers walk-in closet with built in storage cabinets and plenty of space for king size bed and furniture. This home has also been outfitted for wheelchair access that offers 36â€� wide 6 panel interior doors and grab bars in master bathroom. 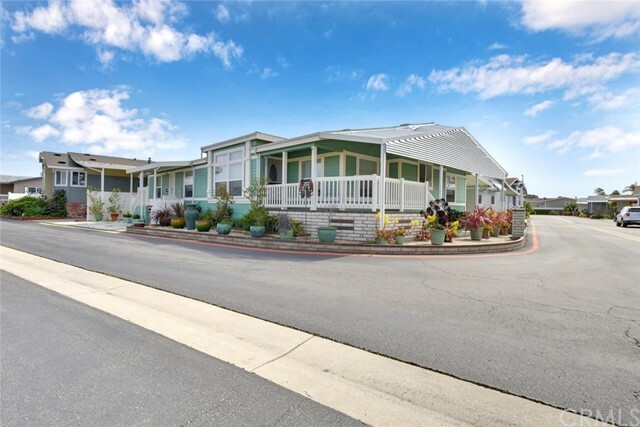 Exterior features include nicely appointed landscaping, custom pavers and masonry provides stellar curb appeal, aluminum awning carport with added siding that reduces sun exposure and a special added 3rd parking space with custom installed wheelchair elevator nearby. Convenient to shopping, restaurants, freeways, airports, parks and much more but most of all a high quality of lifestyle without breaking the bank. For more information or make an appointment to see property ID PW18270413.